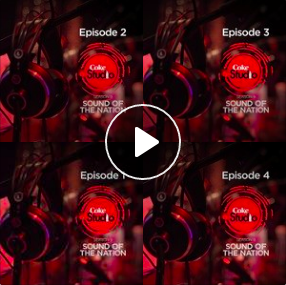 Coke Studio Pakistan, Season 9 – Milliblog top 10 by Milliblog! Season 9 of Coke Studio by Strings was largely a middle-of-the-road affair. I did follow it week after week, but many episodes were completely bereft of anything memorable. So, instead of doing a weekly update, I decided to do it as a top 10… my personal top 10 favorites from this season. Visit Coke Studio Pakistan, Season 9 official website (for full credits on all songs). Playlist of this top 10 at the end of this post – on YouTube and Saavn. The digitally processed prelude is hardly representative of what follows! And what follows can only be described as OP Nayyar meets reggae, with sitar thrown in for good measure! It’s a delightful mix, and Meesha Shafi renders with the right amount of nakhra in her voice, even as the track enters a blues’y phase mid-way! The vocal contrast and interplay between Ahmed Hussain and Umair Jaswal is the clear highlight of the sufi-rock Khaki banda. The duo handle Shuja Haider’s punchy tune really well, with captivating hooks that end on a high. The mid-way harmonium infusion adds generous nativity to the track. Pure Pushto exotica that one can only expect from Coke Studio Pakistan! The prelude is a brilliant chant-style music that showcases the typical Central Asian sound. Zeb Bangash and Faakhir take on the hypnotic tune beautifully, with repetitive phrases set to a superb accordion and rubab base. Naseebo Lal’s high-pitched opening paves way to a fabulously and immersively Rajasthani tune that comes alive with the vocal rhythms and harmonium base! The ‘chori aave na’ hook is addictive, and when Umair Jaswal makes an almost-Palash Sen’ish (Euphoria) entry, the Indian’ness of the song becomes too apparent! The mandatory Middle Eastern/Arabic addition to Coke Studio doesn’t disappoint at all. The ‘Ala baali’ hook, delivered incredible sweetness by Nirmal Roy, with excellent support by a very Sukhwinder Singh-style Jabar Abbas. The song traverses Punjabi, Urdu and Arabic effortlessly to deliver a foot-tapping global concoction! An otherwise traditional wedding-style song gets a generous dose of raucous attitude with the catchy call-out to the brother-in-law (‘Jeeja’)! The Punjabi sound of the song is intoxicating, as it should, given how ‘spirited’ Punjabi weddings are. Meesha Shafi and Naeem Abbas Rufi are perfect to deliver the upbeat tune. Abida Parveen powers Aaqa’s intensely devotional sufi sound like the vocal powerhouse she is. The tune settles into a nicely mesmerizing pattern that is so typical of sufi melodies with generous vocal support by Ali Sethi, and a scintillating profusion of rubab chords. Featuring Noori’s tune and with his own vocals and Shilpa Rao’s, the melody is reminiscent of Vaishnava Janato (raag Mishra Khamaj?). The earthy tune relies on the vocal prowess of the singers as it blends into a simple rhythm before the strings section takes the song to an L.Vaidyanathan level. And there’s Noor Zehra’s sagar veena too, to savour! Baliye is a pulsating fusion! Haroon starts the superbly rock’ish opener and lets it flow beautifully till Quratulain Baloch makes her grand entry singing the ever familiar snatches from laung gawacha, while the background still retains its rock roots. QB takes her own time to expand on the original, but when she does land the hook, it brings the house down! This is the sweetest track of this season of Coke Studio Pakistan and a large part of that credit goes to Zeb Bangash’s inimitable singing. Zeb’s rendition, enjoying every lovely Urdu word and verse, and Noori’s tune cleverly repeats the ‘Yeh mausam milne ka hai’ for maximum impact. Milliblog Top 10 from Coke Studio Pakistan Season 9 as a single playlist, on YouTube. Milliblog Top 10 from Coke Studio Pakistan Season 9 as a single playlist, on Saavn.